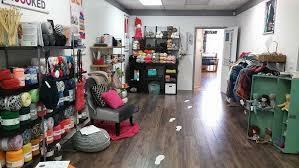 Trendy or What Knot Yarns and Gifts is located in downtown Mission, British Columbia, Canada with online shopping, and this local yarn and gift store offers exquisite handmade artisan items including knitted shawls, scarves, hats, sweaters, handwoven clothing, blankets, and much more. They have authentic yarns and Gifts, and support local yarn artists from all around the Fraser Valley, and with new stock arriving all the time, it's best to visit often. Trendy or What Knot Yarns and Gifts also offer classes and workshops which include a beginners knitting class, knitting my first socks class, spinning for beginners, weaving for beginners, crochet classes for beginners, a two at once toe up socks class, and expand your knitting skills class, sign up for one today and learn a wonderful new hobby and skill.